This is not really a home design project, but it is free fun and, even better, requires pretty much no skill whatsoever. 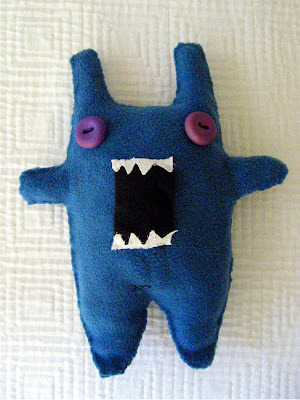 I made this monster doll for my little cousin Danny (nicknamed Danny Monster) who had hernia surgery last week. 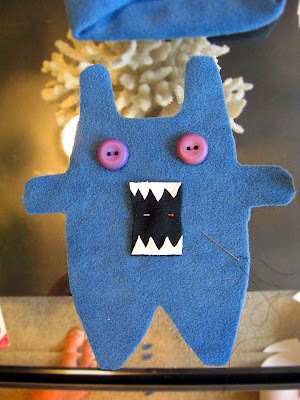 If you look closely, you may note that my monster has stitches in what I believe to be the standard monster hernia area. Supplies were an unattractive fleecy jacket, old sock, fabric napkin, buttons, scissors, needle and thread. Total cost: pretty much zero, excluding my dignity. First I cut out the largest section of jacket fabric and laid out my buttons and sock mouth to get an idea of my monster's dimensions. 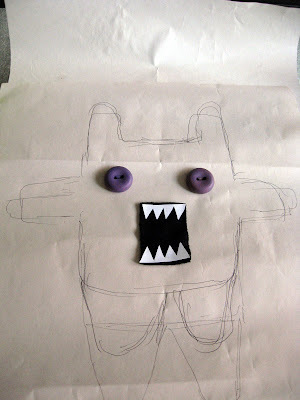 I cut a piece of paper to the size of my fabric and sketched out a monster shape. I folded my paper in half to make the two sides of the monster symmetrical, although symmetry is by no means a requirement. 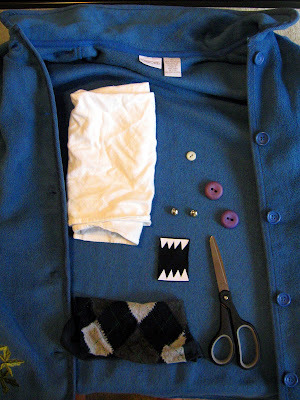 I then hand-stitched the front and back together and stuffed the monster with cut-up pieces of the rest of the jacket. 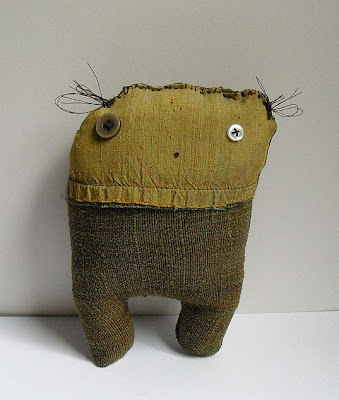 If using a sewing machine, put the front and back of the monster together wrong sides out and stitch, leaving a space for stuffing. Turn the monster inside out and stuff. 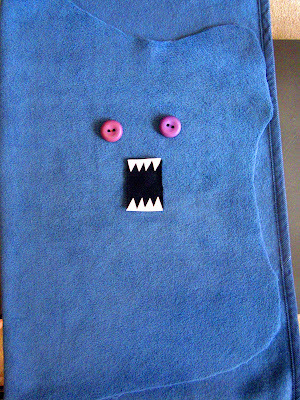 I believe a machine-sewn seam would have improved my monster, since he is already looking frayed at the edges. 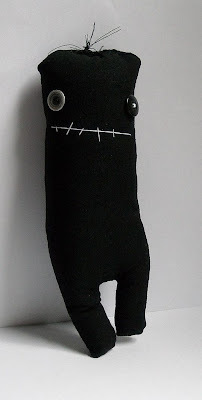 Otherwise you pretty much can't go wrong, as you can see from some of my favorite handmade monster toys. Go forth and scare small children. That is SO sweet! What a thoughtful gift. Awesome idea! Eep... I just fell in love with that olive green one! So cute.. I love them. Great call on what to do with an old ugly fleece jacket too. 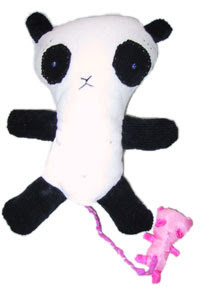 these are my favorite types of stuffed toys and b likes them too so we always have to stop ourselves from buying them. 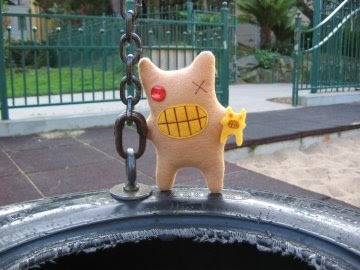 ugly dolls are the best. good job! They are sweet little monsters! You are a crafty one. you'll need to drop by, I'm having a fabulous giveaway. These are such sweet wee monsters. I suppose they would scare some children, but probably not my granddaughter. Who uses my art skeletons as dolls when she comes to visit and tells me to be quiet because the monsters in the bushes are napping.